If you are here for podcast, scroll down to the previous post. The Two Ewes are having an Instagram contest. Post pictures of knitted or crocheted items that hold special memories for you. Tell us a little about the memory and use the hashtag #knittedmemories. Since it is an Instagram contest you need not be a member of the group to play. You can enter as many times as you want. Join in the fun! Share your #knittedmemories with the Instagram world! Instagram posts with this hashtag will be randomly selected for prizes in the mid-January podcast episode. Handspun by me (Kelly). 450 yards, 4 ounces of BFL silk. I call this colorway Electric Sherbet. The fiber is dyed by Wool Gatherings. Another Door Opens shawl pattern by Sara Bauer (aka Sarapomegranate of the Yarns at Yin Hoo podcast). 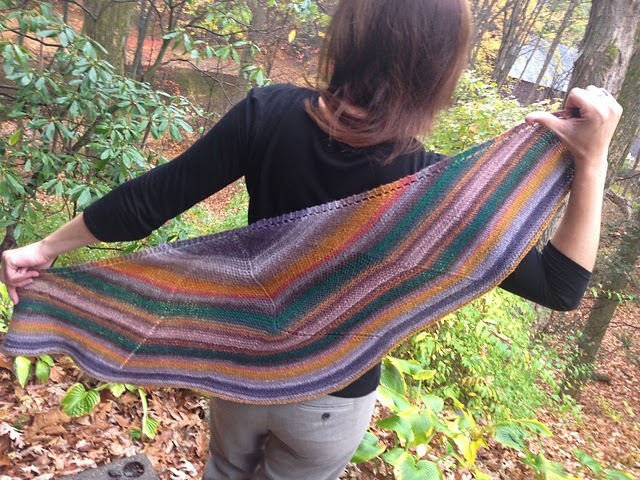 Sara has generously donated a copy of this beautifully elegant shawl pattern inspired by memories of a Gingko tree.